PROWLER ROAD #4 – Overnight serviced site – Measures 40ft deep X 27ft wide – 30 amp hydro, Sewer and potable water hook ups. – located directly in front of the children’s playground and close to pool, mini putt and basketball nets. Can accommodate up to 38ft units booking nightly. For Seasonal Inquiry please call office. 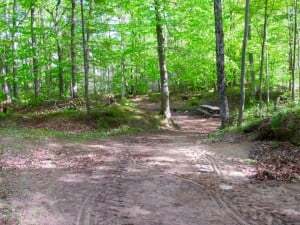 PROWLER ROAD – The first road in the park. Close access to the Children’s playground, pool, and public washrooms and showers. Great road for families with kids. Just put your feet up, and watch the kids play at the park from your site! CEDARCREEK ROAD – The third row back in the park before the wilderness area. Quiet, with mature trees that offer more shade. This path takes campers into the Wilderness (tenting only) area. TERRY ROAD – #3 – Overnight serviced site – Measures 36ft deep X 26ft wide – 30 amp hydro, Sewer hook up and potable water. Can accommodate up to 27ft units when booking nightly. *Seasonal inquiry, please call the office. One street back from the children’s park. TERRY ROAD # 7 – Overnight serviced site – Measures 36ft deep X 22ft wide- 30 amp hydro , Sewer and potable water hook ups. Can accommodate up to 28ft trailer when booking nightly. *Seasonal Inquiry please call the office. Overnight sites on either side. TERRY ROAD – Located in the middle of the park. Available sites on this road often go to families renting 2 sites as we currently have 2 side by side serviced sites available for overnights or seasonal selection. WILDERNESS SITE # 3 – Overnight Unserviced Site – All set up and ready to camp! WILDERNESS SITE #2 – Overnight Unserviced Site – This is a flat grassy site nestled in the entrance to the wilderness section of the park. Close to temporary washroom site in July and August as well as potable water. WILDERNESS SITE #3 – Overnight Unserviced Site – This photo shows how you enter this wilderness site. Sarah likes to call this part of the site “The Mud Room” Where you park your car before walking into the camping area of this site. Great site for a larger family with many kids. WILDERNESS SITE #4 – Unserviced Overnight Site – Perfect for a couple or smaller family. Surrounded by mature trees and nature. 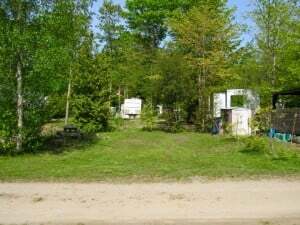 WILDERNESS SITE # 8 – Unserviced Overnight Site – Another popular wilderness site. One of our most requested. This photo shows the length of the site. WILDERNESS SITE # 8 – Unserviced Overnight Site – This photo is taken from the road. Lots of space for parking, dining tent and sleeping tent.